Review posted December 13, 2017. Ballantine Books, New York, 2017. 176 pages. Anne Perry’s Christmas murder mysteries have become a holiday tradition for me. They’re cozy; they’re short; and reading one is a nice way to indulge myself as Christmas approaches. A Christmas Return features Charlotte Pitt’s grandmother Mariah Ellison, who is asked for help with a striking message – a Christmas pudding with a fake cannonball inside. She’s being told that someone is digging up the case about an old friend who was killed when his bookcase fell over and a decorative fake cannonball struck him, which happened twenty years before. The dead man’s grandson is asking for her help. He was only ten years old when the death happened. Now he wants Mariah’s help clearing his grandmother’s name. Mariah was there at the time, so she alone can help. 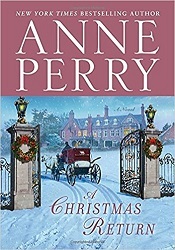 These Christmas mysteries are short, but Anne Perry gives us enough back story to care. And there’s something nice at Christmas about seeing justice done and good people vindicated.